While not as old as the NBA, the Women’s National Basketball Association (WNBA) has closed the gap in terms of popularity. Established in 1996, it is impossible not to draw similarities between the two games of professional basketball. Punters can enjoy placing bets on their favorite WNBA side, in conjunction with support a team from their state. With only twelve teams, bettors can follow their chosen side with relative ease with a shorter season. 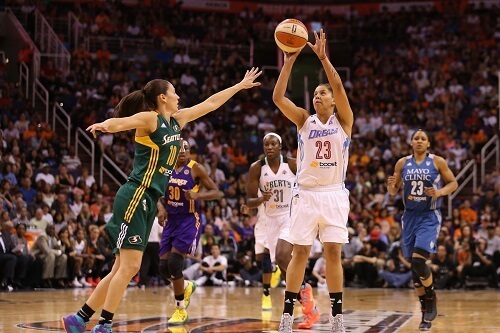 Read our guide on betting on the WNBA, and find out the different predictions on each game. Similarly to the NBA, the league is divided into the Eastern and the Western Conference. Bettors can start betting on basketball games from the regular season which starts from May to September. The teams qualify for the playoffs and battle it out in the WNBA Finals annually from September to October. The WNBA scores and results are just some of the bets that US punters can wager on, however, it is common knowledge that every bet should be informed by some stats. Bettors ought to browse the WNBA standings to find out how the team has been faring in their games. The betting odds will be determined by the team’s stats over the course of the season. Your WNBA picks should be influenced by court advantages, that is if a team is playing at home or not. While the NBA may be a high-scoring league, the WNBA does not share the same vigor. It is safer to bet on more defensive results than the alternative. Look at a team’s previous results along with the head-to-head contests before you make a bet. The WNBA website commonly has the latest updates on all the WNBA games, news and players. This will inform the players of any injuries, missing players and top picks for the day. As a note, bettors should maintain an interest in the sport before they decide to bet on the Women’s National Basketball Association league. Any inconsistency in this regard will result in losses. Punters can find the best US sportsbooks to bet on WNBA games on our table. Head over to our top picks and start betting today.